We understand that when you provide us with information about yourself, you trust us to act in a responsible manner. We believe this information should only be used to help us provide you with better service. That’s why we have put a policy in place to protect your personal information. Below is a summary of our policy. At Florence Oregon Vacation Rentals, we take privacy concerns very seriously and are committed to ensuring that your personal information is secure at all times. We will only share your personally identifiable information in the following ways. The personal information you provide will only be shared with the appropriate third parties necessary to complete your purchases. This includes the vendors we have selected (e.g., credit card authorization companies). The personal information we provide these third parties will ONLY be that which is necessary to ensure your travel arrangements are successfully confirmed and executed. We will protect the quality and integrity of your personally identifiable information. We have implemented appropriate technical and managerial procedures to maintain information that is accurate, current, and complete. We will make every effort to respond to your requests to correct personal information inaccuracies in a timely manner. We will take appropriate steps to protect your privacy. Whenever you provide sensitive information (such as a credit card number to make a purchase), we will take reasonable steps to protect it, such as encrypting your card number. We will also take reasonable security measures to protect your personal information in storage. Credit card numbers are used only for payment processing and are not retained for marketing purposes. 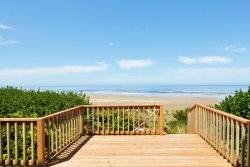 Florence Oregon Vacation Rentals, Inc.